I met UNICEF's executive director Ann M. Veneman recently at Her Majesty Queen Silvia of Sweden's World Childhood Foundation luncheon at the United Nations. Ann spoke strongly and compassionately on the appalling conditions of children around the world - especially child victims of sexual abuse and exploitation, which World Childhood Foundation attempts to counter. Ann agreed to chat with me the next week at her office and what a chat we had - we could not stop. 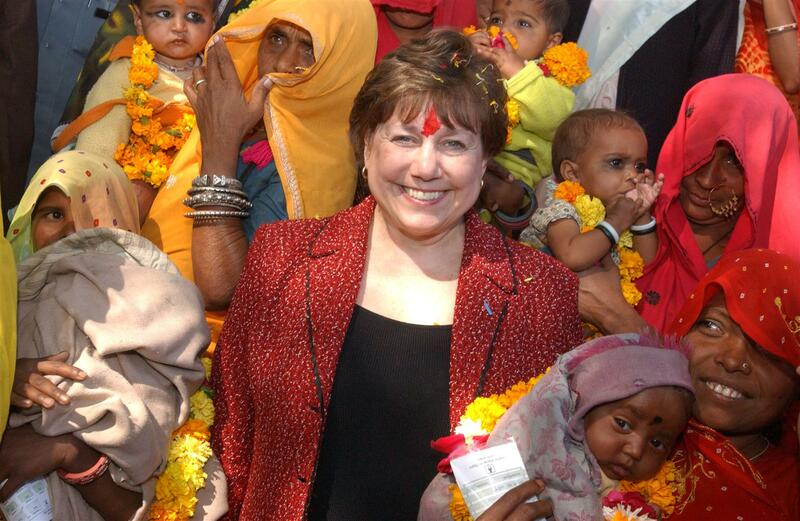 Ann M. Veneman became UNICEF's fifth Executive Director in 2005. Photo (c) UNICEF. 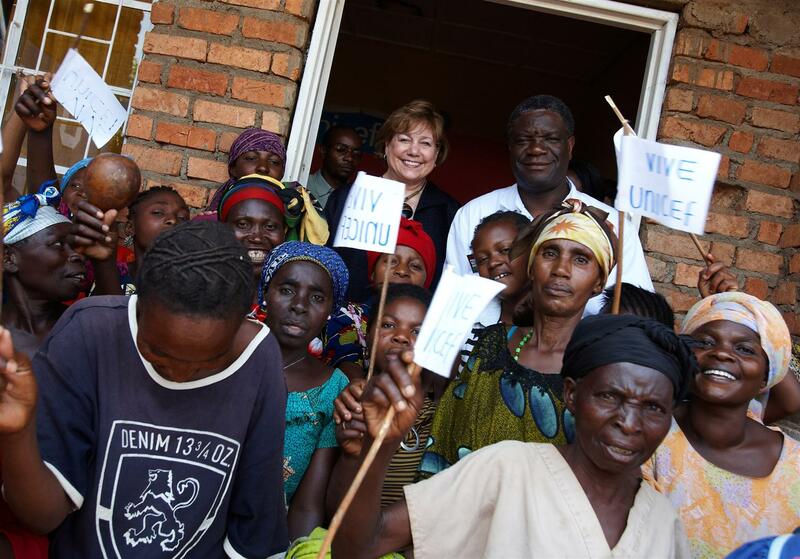 Ann became UNICEF's fifth Executive Director in 2005. Appointed by then U.N. Secretary General Kofi Annan, she works on behalf of the U.N. children's agency to help children around the world survive and thrive by advocating for and protecting their rights. 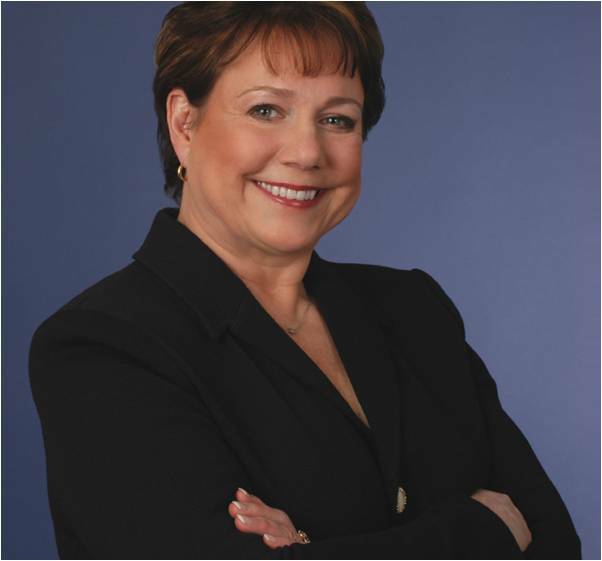 According to Forbes Magazine, Ann ranks #46 out of "The 100 Most Powerful Women." Forbes' Power Women list isn't about celebrity or popularity - it's about influence. Michelle Obama is #40 and Oprah Winfrey is #41. "The challenge UNICEF is facing is very difficult," Ann began our interview in her conference room overlooking the Manhattan skyline. 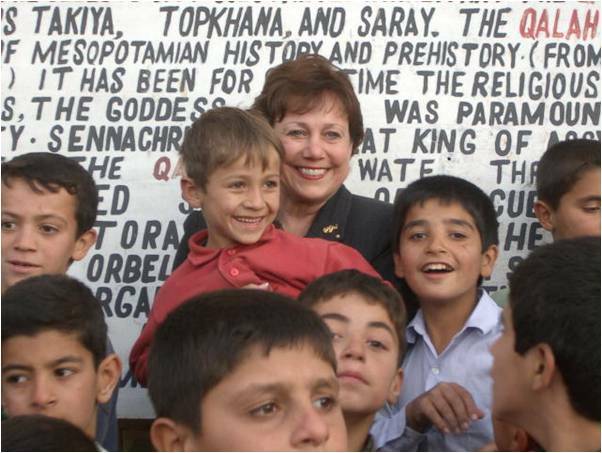 Then Secretary of Agriculture Ann Veneman inspected U.S. food aid efforts in Iraq. "What I have done since coming aboard is to see how we can facilitate the maximum results for children. How can we work cooperatively with various organizations to leverage resources towards creating sustainability? Our goal is long-term, sustainable programming. "I am pleased to have witnessed over the last few years more collaboration among NGOs helping children. I now speak at events hosted by Save the Children, for example. UNICEF is a global leader in helping children, but we will work with any group that has the resources to help the cause." "This cooperation is a sea-change in international development over the last 5-6 years. It is critical to helping the world's neediest," Ann explained. Save the Children. Working to create lasting, positive change in the lives of children in need, Save the Children shares UNICEF's desire to ensure that children in need grow up safe, educated and healthy, and better able to attain their rights. CARE. Ann co-chairs Mothers Day Every Day, a campaign launched by CARE and the White Ribbon Alliance supporting access of basic health care and maternal services for women around the world. SOS Kinderdorf. A remarkable organization, working with the local communities where they serve, and moving more into family care. In Syria where I visited, they have adopted UNICEF's thinking about family care. It seems the perfect mix, providing what makes sense for the kids. "Today, development is very data-driven," Ann explained. "What are the specific problems, and how can they be addressed the most cost-effectively?" UNICEF's mission is accomplished by over 11,000 staff on the ground in more than 150 countries. They work to support child health and nutrition programs, quality basic education, the protection of children from violence, exploitation and AIDS, as well as access to clean water and sanitation. At UNICEF, Ann oversees annual program resources of more than $3 billion, funded entirely from voluntary contributions. She has stressed a culture of continuous improvement to help achieve lasting results for the world's children. visit a science class at The Young Women's Leadership School of East Harlem in New York City. Under her management, UNICEF has launched initiatives to improve business practices, transparency, and collaboration. These efforts ensure the agency's programs reach those most vulnerable and that its resources are utilized efficiently to protect, save, and improve the lives of children around the world. Her strategies include establishing a results-based approach to program management and scaling up the use of integrated packages of interventions to the health and development of children. UNICEF has recently released figures that show death rates of children under the age of fived continued to decline in 2008. The data shows a 28% decline in the under-five mortality rate, from 90 deaths per 1000 live births in 1990, to 65 deaths per 1000 live births in 2008.
project site in Rajwas Village in Tonk District in the western state of Rajasthan. According to these estimates, the absolute number of child deaths in 2008 declined to an estimated 8.8 million from 12.5 million in 1990, the base line year for the Millennium Development Goals (MDGs). "Compared to 1990, 10,000 fewer children are dying every day," Ann said. "While progress is being made, it is unacceptable that each year 8.8 million children die before their fifth birthday." The new estimates are the result of collection and analysis of a range of data sources by demographers and health experts from UNICEF, the World Health Organization, the World Bank, along with the U.N. Population Division, guided by technical advisors from a number of major academic institutions. The data shows global under-five mortality has decreased steadily over the past two decades, and that the rate of the decline in the under-five mortality rates has increased since the 1990s. The average rate of decline from 2000 to 2008 is 2.3%, compared to a 1.4% average decline from 1990 to 2000. Public health experts attribute the continuing decline to increased use of key health interventions, such as immunizations, including measles vaccinations, the use of insecticide-treated bed-nets to prevent malaria, and Vitamin A supplementation. Where these interventions have increased, positive results have followed. Progress has been seen in every part of the world, and even in some of the least-developed countries. A key example is Malawi, one of ten high under-five mortality countries in 1990 that is now on track to meet the U.N. Millennium Development Goal of a two-thirds reduction in under-five mortality by 2015. Estimates show that under-five mortality in Malawi has fallen from 225 deaths per 1000 live births in 1990, to 100 per thousand on 2008. In 2000, only 3% of children under five slept under a mosquito net - a key means of preventing malaria, whereas by 2006 this had risen to 25%. Malawi has focused its limited resources on improvements in health and health systems and the use of the most effective interventions, with the result that significant numbers of children's lives have been saved. The new data also shows that seven of the 67 high mortality countries (those with under-five mortality rates of 40 per thousand live births or higher) have consistently achieved annual rates of reduction of under-five mortality of 4.5% or higher. These are Nepal, Bangladesh, Eritrea, Lao People's Democratic Republic, Mongolia, Bolivia, and Malawi. Impressive gains have also been made in countries that are not fully on track to meet the Millennium goal. Niger, Mozambique, and Ethiopia have all reduced under-five mortality by more than 100 per 1000 live births since 1990. While progress has been made in many countries, the global rate of improvement is still insufficient to reach the Millennium Development Goals, and Africa and Asia combined still account for 93% of all under-five deaths that occur each year in the developing world. "A handful of countries with large populations bear a disproportionate burden of under-five deaths, with forty per cent of the world's under-five deaths occurring in just three countries: India, Nigeria, and the Democratic Republic of Congo," Ann said. women at the "Maison de Transit Dorcas" in the Democratic Republic of the Congo. "Unless mortality in these countries can be significantly reduced, the MDG targets will not be met." In some countries, progress is slow or non-existent. In South Africa, the under-five mortality rate has actually gone up since 1990. The health of the child is inextricably linked to the health of the mother and South Africa has the highest number of women living with HIV in the world. Recent commitments by the government to scale up interventions to prevent mother-to-child transmission of HIV/AIDS should help improve the situation. The survey data incorporated in these estimates generally reflects mortality over the preceding 3 to 5 years. This means that major improvements in provision of nets for malaria prevention, of vaccines against meningitis (HiB) and of vitamin A supplementation, improved prevention of mother-to-child transmission of HIV and of pediatric HIV, and further progress on protecting against measles and tetanus may not yet be fully reflected in the data. Progress can be accelerated even in the poorest environments, through integrated, evidence-driven, community-based health programs that focus on addressing the major causes of death -- pneumonia, diarrhea, newborn disorders, malaria, HIV, and under-nutrition. The two leading causes of under-five mortality are pneumonia and diarrhea. New tools, such as vaccines against pneumococcal pneumonia and rotaviral diarrhea, could provide additional momentum. "Achieving the Millennium Development Goal target of a two-thirds reduction in under-five mortality by 2015 will require a strong sense of urgency with targeted resources for greater progress," Ann said. Since becoming Executive Director, Ann has traveled to more than 65 countries to review the plight of children and UNICEF's work to assist them. She has first-hand knowledge of how children's lives are being saved and improved as a result of programs and assistance provided by UNICEF and its partners. Ann has witnessed the devastation caused by natural disasters, conflict, disease, and exploitation. These experiences have redoubled her sense of hope, passion, and urgency in advocating for children when administering programs, meeting with government leaders, international agencies and strategic partners, or speaking at conferences such as the World Economic Forum and the Clinton Global Initiative. Not only is Ann an incredibly powerful woman, but she is particularly well-mannered. Within hours of our interview I received a personal note, "I really enjoyed our discussion yesterday. Thanks so much for coming over. You have a fascinating background. I am so impressed with the decisions you have made in your life to make a difference in the lives of others." Ann is a thought leader and global citizen of the highest order.